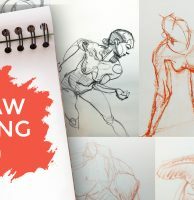 Welcome to the Draw Along Club! We’ll put up a series of poses and draw them on screen. 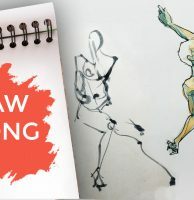 If you like, you can get your sketchbook out and draw with us. 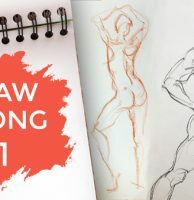 We chat about the drawings themselves, what to look for in the poses and life drawing in general. 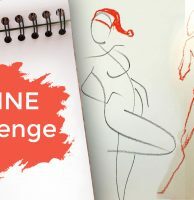 In this one, we take on the Geometric Shape Challenge. We tried to draw these poses using only 3- and 4-sided geometric shapes and circles and ovals. We were allowed to fill the shapes with flat tone, and we were allowed a few gestural lines at the start but that was it. It was really tricky, and some of our drawings went quite terribly wrong, but that is all part of the learning and the fun. Hope you’ll join us and get that key ingredient to progress – challenging practice!